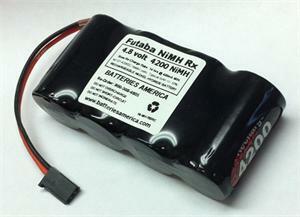 4EP4200SC : 4.8volt 4200mAh rechargeable NiMH receiver battery for RC hobby. Made with 4 Sub-C size NiMH cells. Choose Flat, Square, or Offset shapes. Choose Wire Leads, or add choice of connector (Futaba, Spektrum-JR-HiTEC, Airtronics) for $3.00. Dimensions of Flat pack: 3.5" across, 1.8" tall, 0.88" thick. Weight: approx. 9 1/2 ounces. Why offer extra connectors? When this battery pack is installed in a model, the connector typically goes into the switch harness. An extra connector, such as the blue EC3, enables speedier charging with high-amp charging systems, and you don't have to unplug anything. These battery packs are manufactured in the USA by BATTERIES AMERICA.